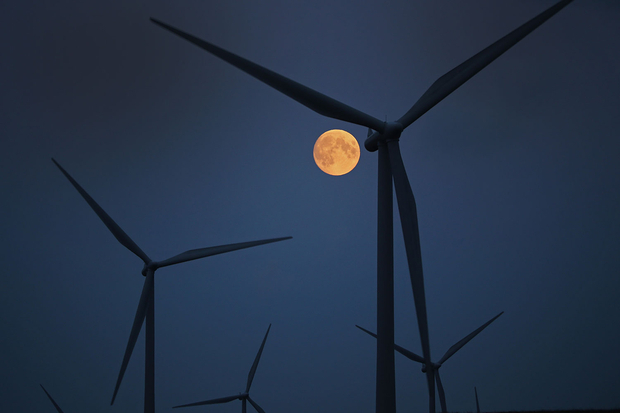 The moon rises behind the turbines of Whitelees Wind Farm on October 7, 2014, in Glasgow, Scotland. Whitelee Wind Farm is the largest wind farm in the U.K.
By Charlotte Middlehurst, chinadialogue Managing Editor. This article was first published by chinadialogue. China has overtaken Europe to become the world’s biggest producer of wind power after its domestic sector grew by 60 percent last year. Following a government-backed drive to build new wind farms, China’s installed capacity now totals 145.1 GW, surpassing the E.U.’s 141.6 GW, according to a new report by Global Wind Energy Council (GWEC) published earlier this month. *Figures for the People’s Republic of China are provisional. “Wind power is leading the charge in the transition away from fossil fuels,” said Steve Sawyer, Secretary General of GWEC. “Wind is blowing away the competition on price, performance, and reliability, and we’re seeing new markets open up across Africa, Asia, and Latin America which will become the market leaders of the next decade,” he added. The Chinese government’s drive for clean energy is motivated by the need to reduce its dependence on coal at a time when heavy industry is slowing down, and when the choking smog that shrouds China’s cities is causing a national healthcare crisis. In 2015, the world’s wind power industry grew by 22 percent year-on-year, following the installation of over 63 GW of new capacity. Chinese wind energy accounted for 30.5 GW, almost half of the global total. The U.S. sector reached 8.6 GW. Meanwhile, Germany led in Europe, with a record 6 GW of new installations, including 2.3 GW offshore. Germany’s total global capacity reached 43.2 GW at the end of 2015, representing cumulative growth of 17 percent, one of the highest seen by any country. Elsewhere in Asia, India added 2.6 GW, overtaking Spain into fourth place in terms of cumulative capacity, after China, the U.S., and Germany. Japan, South Korea, and Taiwan also increased their volume of wind power. Despite the growing contribution of wind to the energy mix, China’s power generation is overwhelmingly reliant on coal. And even though China has more wind capacity than any other country, much of its potential is unused because of grid problems, which include preferential access for coal-fired power to the grid and delays in building new infrastructure. China’s National Energy Administration warned of suspensions of wind farms in Inner Mongolia, Xinjiang, and Jilin due to problems with new installations connecting to old-fashioned power grid, reported state news agency Xinhua.